Maybe it’s just me, but I’ve always sensed that something changes forever when you finish reading a novel that has recently become a cherished part of your life. While you’re immersed in the story, all possibility remains open, and you grab every opportunity to rush back into that unfinished world. But as the last word approaches, and, inevitably, when you arrive at that word, see it, hear it, and process it, you know you have crossed a line you hadn’t realized was there. The story is over, and you have experienced it in its finitude. The poignancy of book endings hits me often, not just with Station Eleven. Every story’s ending brings a sense of closure, a good thing, but also a sense of loss. As I approach that end, I realize that I am about reach a point of no return. Not only will my life from here on out be transformed—never again can I read these words for the first time or live in anticipation of finding out what happens next—but I read each final page or so acutely conscious that the universe of this novel is on the verge of shrinking. Another sentence, another word more, and what had been unlimited becomes exactly what it is and nothing more. I also feel that the door that let me live in that universe has been shut to me forever. Yes, of course, I could flip back pages and re-experience the middle, or any other part, of the book. Yes, of course, I could re-read, and re-delight in, the entire novel. I could ponder and parse every word, scrutinize passages repeatedly and write critical essays, and discover new things all along, realizing something I missed, or many things I missed, every time I did. I could devote my entire life to studying a single passage of this or any book and potentially, even probably, discover new things in it all the time, on different readings, at different ages, with different life experiences. But, still, something is lost on finishing that last word for the very first time, something that can never be regained: being in the moment when you travel for the very first time through a tale and have not yet seen its borders. What was alive and full of promise suddenly, in the second of reaching and realizing that last word, becomes limited and static. You know everything you’ll ever know about what moment’s before had remained an alternate universe, one that allowed you to enter and explore to your heart’s delight. Suddenly you know all there is to know about it. Until you hit that last word, anything is possible in that make-believe world. You can flip back pages, but once you have reached the end, you are merely looking back. As Joni Mitchell put it: “We can’t return, we can only look behind from where we came.” The end is the end, not only of the story, but of your privileged position to be part of it. Station Eleven is actually a book about endings, so it’s not surprising it left me pondering these things. It is the story of the end of civilization after a virulent flu pandemic wipes out much of life as we know it. The remaining pockets of survivors—including, intriguingly, a nomadic band of musicians and Shakespearean actors and musicians—must learn to survive, and go beyond survival, in a world marked by endings. The end of cities. The end of electric lights. The end of underground trains, jet planes, and rocket ships. So many things most of us now take for granted, whether the Internet or cell phones or antibiotics, even the simple taste of an orange, are gone. The end has even come for mundane objects such as credit cards, driver’s licenses, toasters, and red stiletto heels. which one character now displays in his Museum of Civilization, objects of wonder in their utter irrelevance. The book is filled with smaller endings, too—the ending of careers, the ending of love affairs, and the ending of human lives. In fact, the novel begins with an ending, an actor dying on stage while portraying King Lear, and in the very last pages the book returns to this moment when, in a flashback, this same actor contemplates the moment of his death, noting that it is just like being in the midst of a beautiful snowstorm. This scene is immediately followed by the contemplation of yet another death, this one described as exactly like waking from a dream. 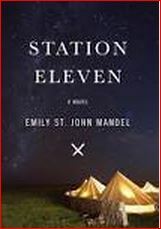 There is also the world of the namesake of the novel, Station Eleven itself. Created as part of a graphic novel by one of the book’s main characters, Station Eleven is a space station that has been designed to resemble a small planet and that is inhabited by people who escaped a hostile takeover of the earth thousands of years from now. After slipping through a wormhole, this planet-like space station hangs somewhere in the reaches of deep space, damaged beyond repair so that the only land left is a series of islands that were once mountaintops bathed in perpetual sunset, twilight, or night. There is another world within the world of Station Eleven, however: the world of the Undersea, a network of fallout shelters under the oceans where people longing for home and daylight and Earth reside. All they want is to see sunlight again in a world now lost to them. No wonder then that the consciousness of ending, the sadness I felt at leaving one world and being thrust back into another, was so acute this time around. Throughout the book are constant reminders that any world, anywhere, the world of a planet, of a civilization, of a human life, or of a human relationship, could end at any time; accordingly, there are also frequent reflections on the importance of savoring the moment and appreciating what is always in danger of being lost. Whether there is too much world or not, it is unquestionably time for me to say goodbye to another one of them. I was so reluctant for Station Eleven to end that I closed the book before reaching the last word and instead sat down to write this essay. It is now time to return and stop prolonging the inevitable end.